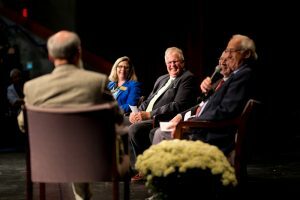 Friday afternoon’s Presidential Forum at Eastern Mennonite University’s MainStage Theater offered a rare opportunity to hear from four leaders: three who have led the institution through major cultural and curricular change, and a fourth whose current leadership symbolizes a new beginning and new challenges. 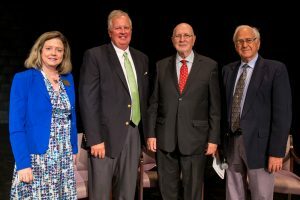 From left: Current president Susan Schultz Huxman with presidents emeriti Loren Swartzendruber, Joe Lapp and Myron Augsburger at the MainStage Theater for a Q&A panel. Each president was asked to share a defining moment in their presidency, an achievement or accomplishment, and a prank or humorous story. The library fund drive of 1969 made Augsburger’s highlight list. The event drove then-Eastern Mennonite College into national view, primarily for the student-led weekend fundraiser that raised $111,000 in four days at a time when many college campuses were places of unrest and dissent. Students “gathered things from all over the neighborhood” for a Saturday night auction. As the night went on, the amount rose and rose. 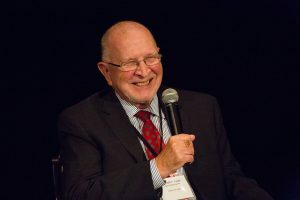 One of Augsburger’s most embarrassing moments came in his first year as president at EMC when he invited his predecessor John R. Mumaw to speak in chapel. The night before, a drama had been staged and the banner that displayed the college’s motto “Thy Word is Truth” had been temporarily taken down. Joe Lapp, a 1966 graduate of Eastern Mennonite College and an attorney by profession, came to his presidency after 13 years on the board of trustees. An enrollment boost helped both revenue and morale, as did entrepreneurial development of programs that became new revenue sources, such as the Adult Degree Completion Program, the Intensive English Program, and the seminary’s Clinical Pastoral Education program. This era also saw the founding of successful graduate programs, including the Center for Justice and Peacebuilding and the Masters in Counseling program. Read more about Joe Lapp’s influential years. “I thought I needed to be an encourager of new ideas,” he said. Lapp was also the only president to sport hair below his collar. It grew long during a cross-cultural trip to the Middle East and he decided not to cut it because “it was more fun aggravating people.” Eventually he pulled it into a ponytail and cut it off, after the YPCA made it into a fundraising event. President Susan Schultz Huxman listens as presidents emeriti Loren Swartzendruber, Joe Lapp and Myron Augsburger answer questions from host Don Kraybill at the Presidents’ Forum. Accomplishments included EMU’s ground-breaking solar installation on the roof of the Hartzler Library and attendance with alumna Leymah Gbowee at the Nobel Peace Prize ceremony. As for pranks, Swartzendruber brought with him a photocopy of an April 2004 issue of the Feather Brain with the headline “Cops bust party at presidential residence.” He speculated that M.J. Sharp, posthumous recipient of the Distinguished Life Service Award during the weekend, may have had a hand in the writing of the article, though as is tradition with the “prank” newspaper, no writers’ names were included. Nine months into her tenure as EMU’s ninth president, Huxman opted to ask each of her predecessors two questions. Lapp remembered one special day when the university was awarded a large grant, affirming the university’s influence and the expertise of its faculty. Huxman also asked the group for recommendations for caring for and empowering spouses. She pointed out her husband Jesse in the audience, and praised Kraybill for giving spouses equal attention in the Centennial history: “Pat, Hannah and Esther are not just footnotes in your book,” she said, referring to Pat Swartzendruber, Hannah Lapp and Esther Augsburger. From the audience, the presidents fielded questions about the early Bible college curriculum, the need for and value of accreditation, shifts within the liberal arts curriculum and growth of professional studies programs, as well as the college-to-university name change. Audience member Mary Ellen Witmer, who worked in the alumni/development office for many years, prompted the sharing by Lapp of a few major events during the time of President Richard Detweiler (1980-87), specifically the loss through fire of the Administration Building. “That was particularly devastating to Richard,” Lapp said, remembering that his predecessor felt deeply the loss of the landmark structure that was then under renovation.